When the US routes were originally commissioned in 1926, US 24 went only as far west as Kansas City. West from Manhattan KS, US 40 was split into two routes: today's US 40 was signed as "US 40-S", and modern US 24 was known as "US 40-N". The two routes joined again in Limon CO. West of there US 40 followed essentially the same route as today. 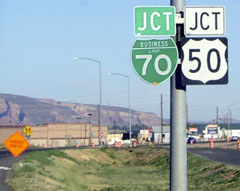 But US 40-S also continued west of Limon, following the path of today's US 24 through Colorado Springs and Minturn CO. From there, US 40S followed what would later become US 6 (better known today as I-70) to Grand Junction, where the designation ended at its junction with US 50. In other words, the west segment of US 40S did not reconnect with mainline US 40. In 1936, the US 24 designation was extended west from Kansas City, replacing US 40-N from Manhattan to Limon and US 40-S from Limon to Grand Junction (US 40-S from Manhattan to Limon became simply "US 40"). The next year, US 6 was extended through the Rockies and all the way to California. Originally it met US 24 at Leadville CO and overlapped with it to Grand Junction. A few years later, after Vail Pass was built, US 6 did not meet US 24 until Minturn. This US 6-24 multiplex between Minturn and Grand Junction lasted for nearly 40 years, until in 1975 the US 24 designation was truncated to its present terminus at Minturn. So today no US routes end in Grand Junction. That was westbound US 50, which continued to the left on North Av. To the right was the west beginning of US 40-S, and later the west beginning of US 24. 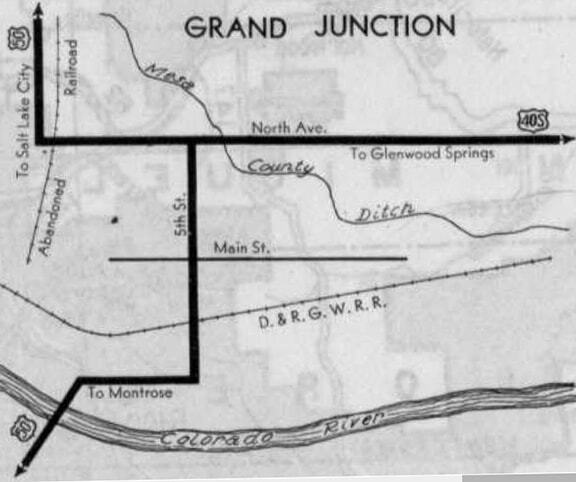 US 6 was extended through Grand Jct in 1937; after that US 24 was co-signed with it between GJ and Minturn. 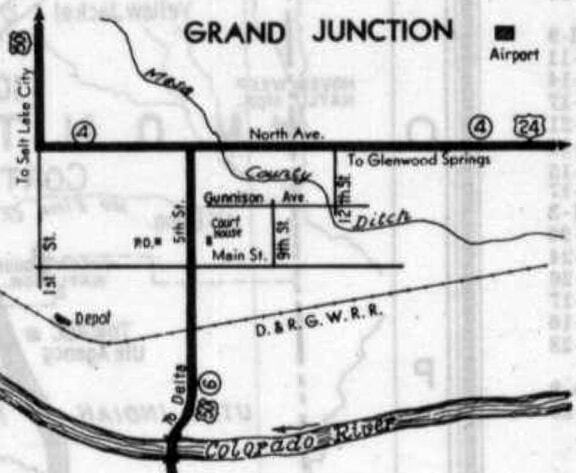 Historic CDoT maps indicate that the diagonal highway which heads northwest from downtown GJ to North Av (a segment of today's Business 70) was built in 1958. The partial interchange at that junction shows up on the 1963 map. That was looking west on North Av (US 6), where it merges with the diagonal highway, heading northwest with US 50 and BL 70. It is likely that was the west end of US 24 until 1975, when the designation was truncated to Minturn.